A couple of years ago, I knew nothing about celiacs and gluten intolerance. I've heard about gluten free diet as a fad back in college, and didn't get why people would want to cut out gluten. Then upon meeting a friend's best friend, I was told that he had celiac disease and could not eat gluten. Now, my roommate is also gluten intolerant. As I started paying attention to it, I realized that it's a pretty hard lifestyle. I thought my roommate would be fine at an Asian restaurant since she can eat rice, but soy sauce is also a no-no! Well, for these people, life just became easier with the opening of Pam Mac D's in Burbank, an entirely gluten-free market. From gluten free beer made with Sorghum (which was actually pretty good, light beer) to almond flour, it carries pretty much everything. They also have packed vegan meals from Rahel Ethiopian Restaurant. 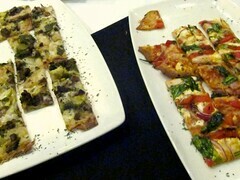 Even if you're not on a gluten free diet, doesn't mean you won't enjoy some of the things here. I absolutely loved the ThinKrisps. I mean, they're cheese crisps!! 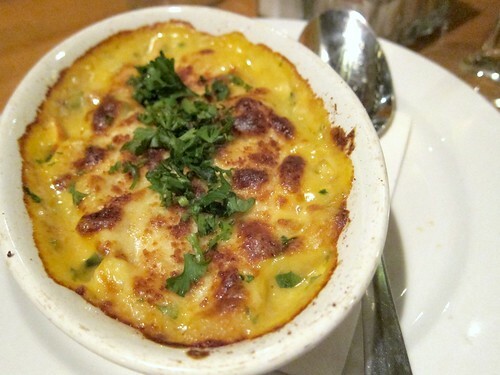 Crunchy, crispy, cheddary goodness that are so addictive. I can eat a whole container in 5 minutes. Last Day for Chimu. Go!! 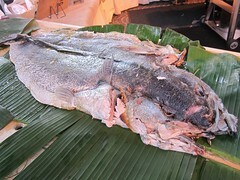 Today is the last opening day of Chef Mario Orellana's beloved Chimu, a takeout window next to the Grand Central Market offering "Peruvian soul food". 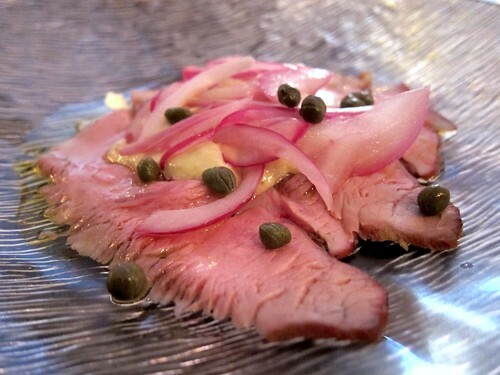 His new restaurant, Red Hill, will be opening in December but he plans on serving "Neo-American" food, which means that today may very well be the last day you can have his Peruvian dishes. So, if you haven't gone yet, change your lunch plans and go! After hearing the closing news, I myself jetted to try it for the first time yesterday. The Lomo Saltado ($12) may well be the best version I've ever had. The beef was so tender and the tomato slices surprisingly juicy. The Seco de Cordero ($11) made with lamb belly, canario beans, and black beer sauce gives a very different flavor profile that is equally great. 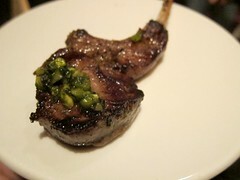 Again, the lamb belly was very tender with lightly crisped edges, the crunchy corn provided a nice texture contrast. 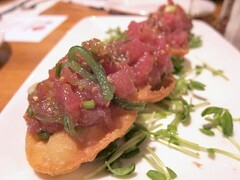 The sauce was rich and slightly spicy. Soul food, indeed. Try the traditional Peruvian drinks, too, like the Chicha Morada (purple corn), green barley tea (I believe this was called Emolliente? ), and Maracuya (passionfruit). 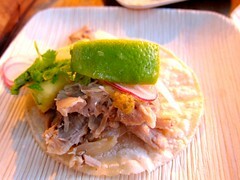 I regretted not ordering the Chancho (pork belly) - I heard that's great too. Really, I should've ordered the whole menu. Maybe I'll see you there today. 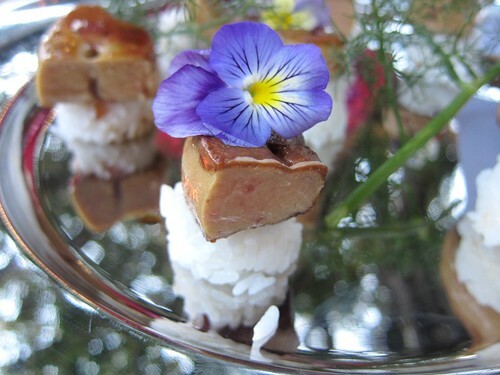 Week two of Foie Fridays. Go foie! Chef Brendan Collins of Waterloo and City quickly became quite famous for his charcuterie, and he expands his repertoire at the new Larry's in Venice. 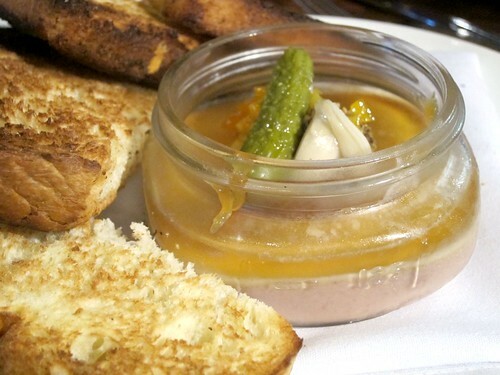 This week's Foie Friday is his Potted Chicken Liver and Foie Gras Parfait ($12), a must try at Larry's for foie fans. The smooth decadence is topped with sweet potato jelly and housemade pickles, and served alongside wonderful toasted brioche. I don't really "get" the pickles, but that aside I could probably easily eat half a pot by myself. Can you taste the difference between bone-in and boneless steaks? How about wet aged vs dry aged? Or meats from America vs New Zealand? or Argentina? Well, now you can learn by tasting them back to back during one of Nick+Stef's Meat 101 classes, starting on Thursday October 20 (that's tomorrow). 10/20: "Which Rib-Eye to Buy?" Bone-in, Boneless, or Dry-Aged. 11/3: "New York, New York, ... and New York!" Same idea as the rib-eye, but with New York steaks. 11/17: "A Well Aged Steak". 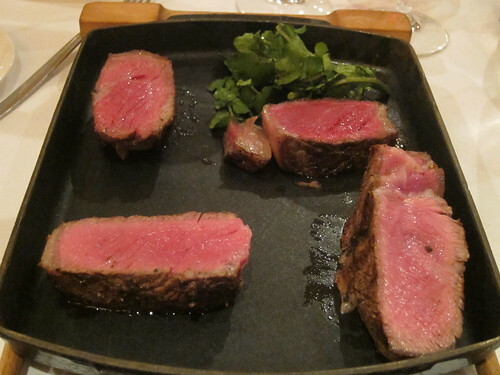 Try wet aged vs dry aged rib-eyes, and wet aged vs dry-agged New York steaks. 12/1: "US vs The World". Learn the difference between steaks (and wines) from New Zealand, Argentina, and America. 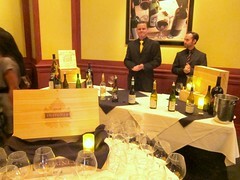 They held a media preview last week for the third class ("A Well Aged Steak"). Clockwise from the top left is the dry aged rib eye, wet aged rib eye, wet aged New York, and dry aged New York. 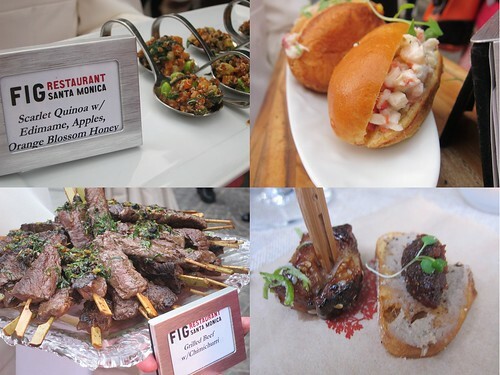 FIG Restaurant at the Fairmont Miramar Hotel recently launched a catering arm (available mostly for events held at the hotel and select off-site events). Just walking into their launch party I already know what I want to have at my wedding (if and when that happens): a whole roasted pig brined in pineapple in chile arbol! 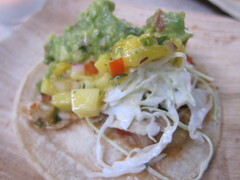 The meat from the two was used to make tacos with island influence (the pork taco was topped with pineapple and the fish had mango salsa). 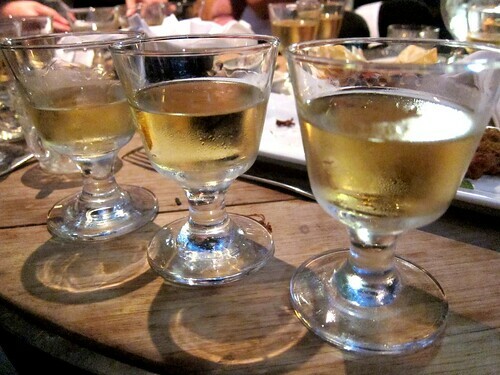 Stay until the end of the night, though, when they start handing out pieces of the crispy pork skin. Cracklins! 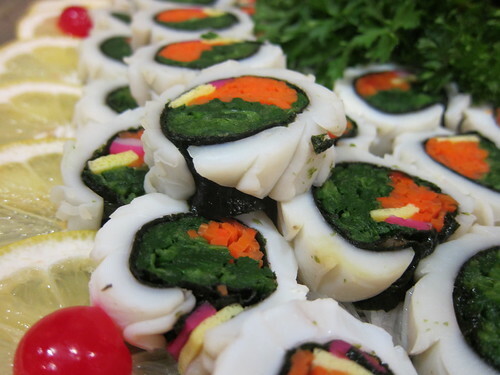 Now, if you'd like a more traditional bites for your event, they can certainly deliver with spoons of quinoa salad, mini lobster rolls, grilled beef skewers with chimichurri sauce, and oh-so-tender braised short ribs. New Chef at Roy's Downtown, and a $20 Giveaway! Roy's Restaurant in downtown LA recently brought in a new chef. Blaine Villasin is a Hawaiian-born Filipino who started his career as a line cook at Roy's in La Jolla after training at the Le Cordon Bleu in Pasadena. The fish was fresh and I certainly liked the intense flavors from the tamari and the black salt, but the chimichurri might be a little overwhelming for the delicate sashimi. 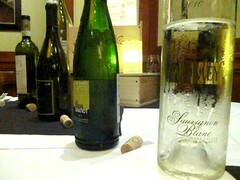 The dish was paired with a glass of Le Colture Fagher Prosecco, Veneto, NV. 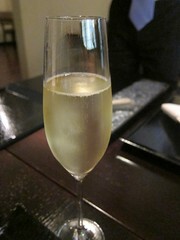 A nice glass of bubbly to start off the night. 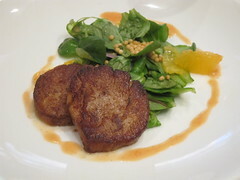 The scallops were tender though they could be fresher, and I liked the addition of kumquats here. 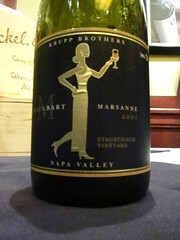 This was paired with a semi-sweet wine, a 2009 Pfeffingen Riesling, Pfalz. 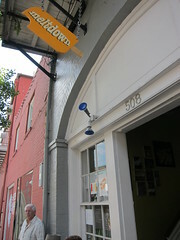 On a blistering hot day in New Orleans - which seems to be every day - there's hardly anything better than a quick stop at Meltdown, a gourmet popsicle store near the French Market. 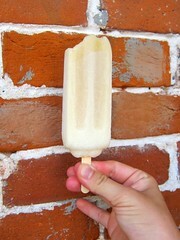 If you're not in the mood for popsicles, they also serve fresh squeezed lemonade. What happens during the winter? Stop by Meltdown anyway for some hot chocolate and soups! 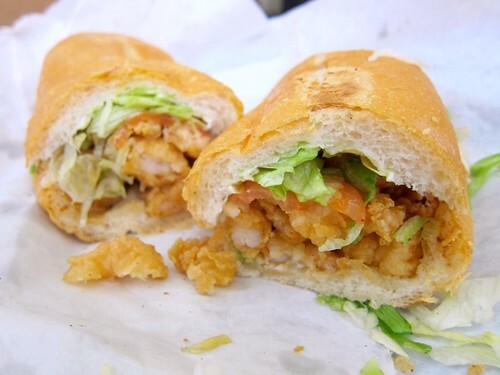 If there is one thing one must eat in New Orleans, it's a po' boy. For my trip two years ago, I did some research and went to Johnny's Po' Boy. 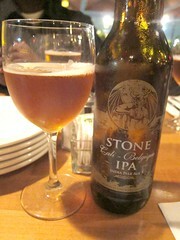 This time, I stayed with a friend's friend and decided to go with the local. She said the best traditional po' boy is at Frenchmen Deli, so to Frenchmen I go! 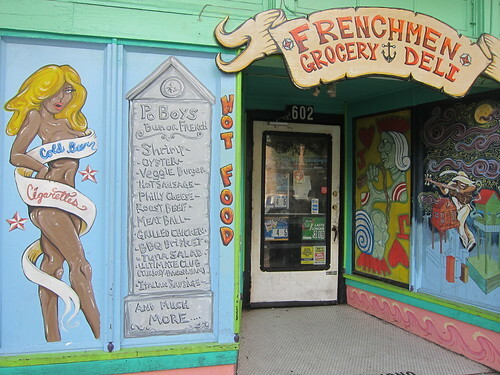 Frenchmen is a tiny grocery store with a deli just beyond the French Quarter. If you walk up Frenchmen St, you can't miss its colorfully decorated front. 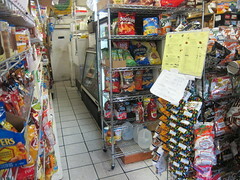 Inside, it's a cramped grocery store with barely any aisle space (they sell Louisiana-made Zapp's potato chips, with many unexplained flavors like Voodoo or LSU Tiger Tators). Order your sandwiches at the register, or call ahead for pickup. My favorite po' boys are probably shrimp or oyster, but since I can only fit one (alas), I went with the Fried shrimp Po'boy ($6.79). As far as po' boys go, you don't choose individual condiments but instead you either ask for it "dressed" (that means lettuce, tomato, and mayo) or not. Crispy battered juicy shrimp, a light touch of mayo, fresh lettuce and tomato, on a fresh, moist baguette. It doesn't get better than this. 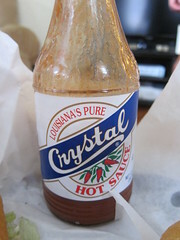 Oh wait, it does get better with a bit of Louisiana's Crystal hot sauce! 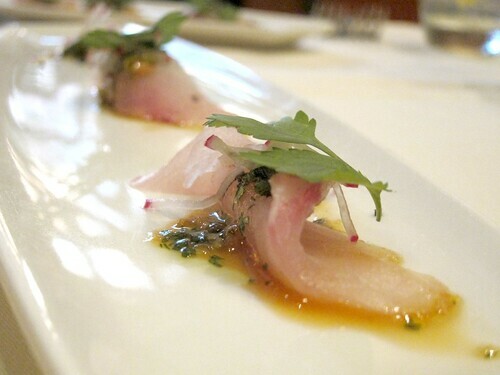 Dining at the W Hotel in Hollywood doesn't have to be stuffy. 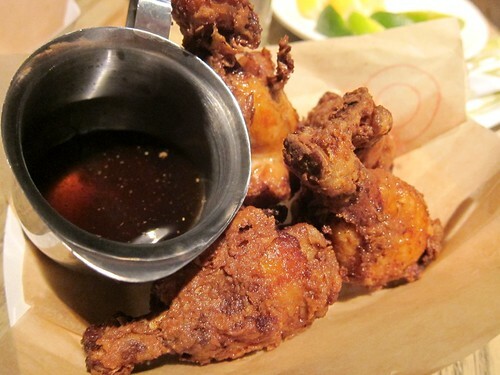 Now you can eat with your fingers after that Pantages show with Delphine's Tuesday Wing Nite. All night on Tuesdays, you can get an order of chicken wings for just $4.50 (4-5 wings per order) and choose from a variety of flavors, not just your usual spicy buffalo wings or fried chicken wings, although naturally they have those also. 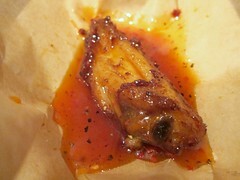 Among my favorites was the grilled chicken wings with Honey Sriracha sauce, sweet and spicy! Don't forget to lick your fingers after. 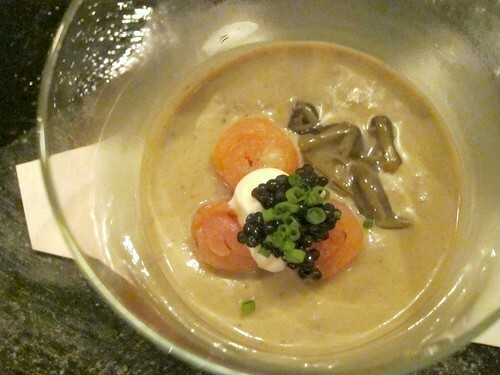 My first kaiseki experience was at Wakuriya in San Mateo, and I was very excited when I found out that Chef Niki Nakayama from Inaka had opened up her own spot in Palms and was serving modern kaiseki. While there is a seasonal menu posted online, Chef Nakayama may change a few dishes any day depending on what looks good in her garden that day. The restaurant was a little hard to find, sitting in a dark corner of Overland Ave. There's no sign, just the number. 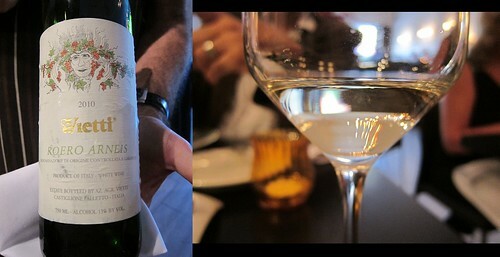 On my visit, we opted for the 9 course Chef's Tasting ($110) with wine pairing ($55). 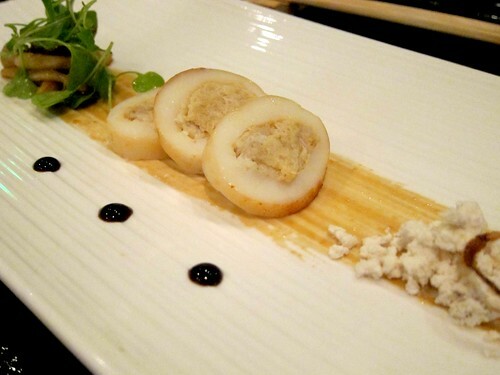 This was one of those item the chef decided to put on after seeing what looks good in her garden that morning, and indeed the eggplant puree was excellent. 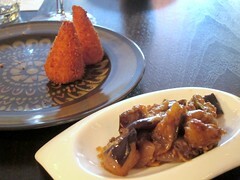 The combination of eggplant and smoked salmon is not one I would've expected, but it worked wonderfully. Get On the Lobsta Truck! I'm not one to chase down food trucks, but I've been curious about the Lobsta Truck for a while since all my friends and fellow food bloggers seem to love it (one Boston transplant says that it's legit). 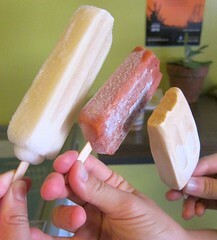 My chance to try it came when they parked outside of Scoops Westside one Tuesday evening. They were already out of the crab roll by the time I got there, so my companion and I got one of each lobster roll: with mayo or with butter. Apparently, for Bostonians, the proper way to eat a lobster roll is with mayo (celery and pepper optional).